If you find a better bargain than this please tell me. Three marks and seventy nine pfennigs for one and a half litres of thoroughly drinkable red wine is a pretty special deal. If it carried a French lable and cost the same price for a normal bottle (three quarters of a litre) you'd feel that you were getting a good deal. So, what is wrong with it? Well, if you accept that you do not get the subtlety of a wine costing four times the price, nothing. The label and the simple taste mean that it's not a slurp for wine snobs but if you want something to wash down a meal then this is it! The first time that I saw this in Marktkauf, it sold out within days. Now it's back. I hope it's back to stay! 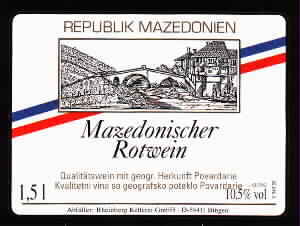 Macedonian Red Wind, Povardarie (that's a region) 1998 DeM3.79 from Marktkauf all over Germany.